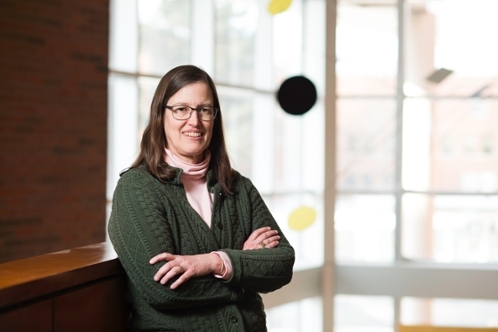 Past the auditory canal, through the eardrum and beyond the cochlea is where you will find the research of Laurel Carney, Ph.D., acclaimed professor of biomedical engineering. Carney’s research focuses on the complex network of auditory nerve fibers that transmit the inner ear’s electrical signals to the brain with the goal of better hearing aids. Her research combines neurophysiological and behavioral studies with computer modeling in an effort to develop hearing aids that make human speech louder and clearer. In June 2015, she earned the William and Christine Hartmann Prize in Auditory Neuroscience from the Acoustical Society of America. And on January 22, the University of Rochester formally installed her as the Marylou Ingram Professor in Biomedical Engineering. The namesake and creator of Carney’s professorship, the late Marylou Ingram ’42, ’47M (MD), dedicated her life to the pursuit of scientific knowledge, paving the way for future generations of female scientists. After receiving her bachelor’s degree from the University of Rochester in 1942, she earned her medical degree at Rochester in 1947 as one of very few women in the program at the time. Dr. Ingram led a long and illustrious career in academic medicine, medical research and teaching. Her pioneering work focused on experimental hematology, radiation biology, cellular biology and immunology. Ingram played a key role in developing automated cell analysis systems, and her work landed on the cover of Scientific American in 90. Her teaching career included stints in the University of Rochester Medical Center’s Department of Radiation Biology and Biophysics, at the California Institute of Technology, and at the University of Miami, where she was the founding director of the Institute for Cell Analysis. In 1982, she joined the Huntington Medical Research Institute as a senior research scientist and the head of the tissue engineering and in-vitro systems until her death in 2013.